Maybe not as highly rated as the Lava Heat Italia embernini we reviewed this Garden Sun table top heater still get some nice ratings. In a hurry? ==>>See the price here!! Available in Black, green and stainless steel. What we noticed again is that some people mention that it gives not enough heat and like we mentioned in all our patio heater reviews is that a patio heater is for a cool evening and not to heat a whole patio on a very cold night. some owners realized that and wrote that it performs real good on a cooler night. Someone mentioned that the heat output went down when the small propane tank went down below 75% and he hooked it up to a larger gas tank. like many people do, and this took care of that minor problem. The used materials and the sturdiness of the design was mentioned as very good for the price you pay and assembly also seems not to be a very big problem. There was one remark that the heater went out for no reason after 10 minutes and they found out later that the gas tank inside was freezing up. After using a larger tank that problem was solved. There is a 50 – 50 divided opinion about this heater in the reviews we read. Most of the lower ratings had to do with the amount of heat this table top patio heater distributes. We have mentioned several times that this kind of heater is for cooler nights and will not keep you patio warm in the winter with low temperatures. In a screened in porch this Garden Sun heater will of course perform better than out on a patio in the wind. 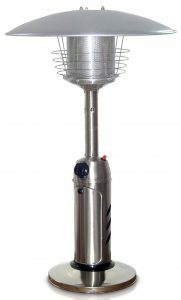 Overall we can recommend this table top patio heater as a descent product and the price related to the performance and quality is good. Like mentioned we think hooking it up to a larger tank is an option that a lot of people use. 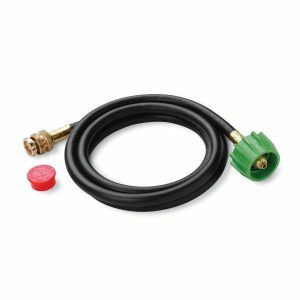 The hose we use our-self for our grill we can recommend as a very high quality hose and we have it now for a few year with no problem. Click here to to see the price.